Mike Boorda was an American naval officer, the first enlisted man in the history of the navy to rise to the post of Chief of Naval Operations. This is a perfect chart of someone who devoted his life to the Navy and particularly for achieving such high office. Sagittarius is the sign of the traveller and explorer and Boorda has the Sun, Mercury and Venus there. His Sun is also conjunct the 9th house cusp of long journeys so the interpretation is pretty simple. The Sun is in very close opposition to the Moon in Gemini conjunct the 3rd house cusp, both sign and house are also associated with travel but generally of a shorter distance than Sagittarius and the 9th. This opposition focuses by T Square onto an apex Mars so the pull of travel and exploration from the opposition propelled him into the armed forces ( ruled by Mars ). Mars is in the Water sign Pisces so the choice would be the Navy. The pull of the Navy is reinforced by Boorda’s second T Square. 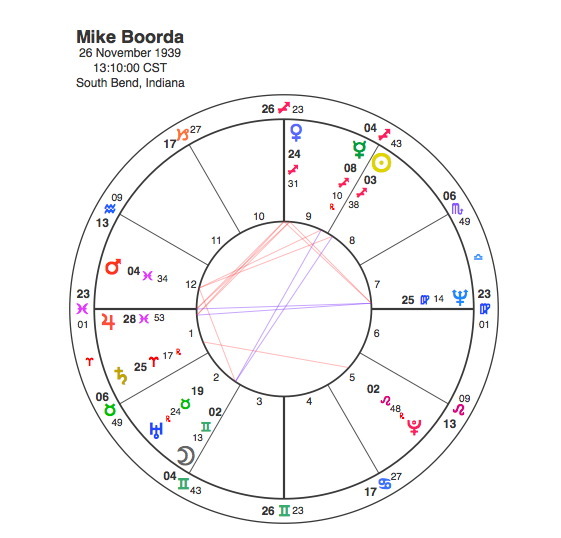 Pisces is also Mike Boorda’s rising sign and he has Jupiter conjunct the Ascendant. Jupiter is the planet that rules expanded horizons and travel and it is in close opposition to the God of the Sea, Neptune. This opposition focuses onto an apex Venus in Sagittarius conjunct the Midheaven confirming that the Navy would be his choice of career. The fact that he rose from the ranks to the very top is clearly shown in the chart from the great advantages of Jupiter rising and the good fortune of an apex Venus conjunct the Midheaven career point. It would be fair to say that his character was not the typical image of a high ranking member of the armed forces. Among the college grads at Officers’ Candidate School, he never quite fit in. With so much Piscean influence in his chart he was bound as he was described – an ebullient man, gentle, with a self depreciating wit, he was also self-contained and reserved. Boorda was by all accounts a superb officer, the “best ship handler in the navy” who genuinely cared for the people under his command. It would seem that all was perfect but any chart with two T Squares would have a lot of difficult issues to deal with. This would be particularly the case with the Sun / Moon / Mars T square. A Sun / Moon opposition or Full Moon is always an astrologically difficult aspect. The individual is pulled in two quite distinctly opposite directions by these two fundamental aspects of the personality. The Sun is the essence and the person’s real path in the life and the Moon is the emotional side and connections to one’s family and roots. The main pull of the opposition came later, however. One problem with having the Sun and Moon in such close opposition is that every transit to one will have a conflicting effect on the other. It also means that the major Pluto transits in a life would be fewer than normal but would be more powerful as a result. Mike Boorda only had two of them. The first one came between 1957 and 60 as Pluto was in a very stressful Grand Cross position, square to his Sun and Moon and opposite his Mars. He had been in the Navy a year at this point but under this transit he got married but most significantly the eldest of his four children, David was born. David was handicapped missing one eye and suffering from Goltz syndrome that causes deformed organs and limbs, he had 17 operations before his fourth birthday. Boorda refused to put David in an institution and he lived at home for the following 38 years. This is clearly depicted by the chart as the Moon rules the relationship between parent and child. Boorda would forever after feel a strong oppositional pull between his career in the Navy ( Sun in Sagittarius conjunct the 9th house cusp ) and the special needs of his family ( Moon ). Pluto was transiting through the 6th sign Virgo and 6th house both relating to health so David’s disabilities were the thing that triggered the opposition. The second and final major transit was in 1996 when Pluto was conjunct the Sun, opposite the Moon and square to Mars. It is hard to imagine a more powerful transit and a bigger turning point in a lifetime. For Mike Boorda it marked the sudden ending of his life. Boorda was an apparent suicide in May 1996, using a .38-caliber pistol that belonged to his son-in-law to shoot himself in the chest. Boorda left a note that indicated that his reason for committing suicide was that he expressed concern about recent criticism of the navy and said that he “could not bear to bring dishonor” to sailors over questions about whether he had improperly worn decorations given to veterans of combat. This referred to a short tour in Vietnam in 1972-1973 as an executive officer of the frigate Brooke, when he won a Navy Commendation Medal. However the ship never joined in the naval bombardment of Vietnam and he was not authorized to wear the combat “V.” He had been wearing a combat medal to which he was not entitled. Told that the medal was not fitting, he said he had made an honest mistake and stopped wearing it. He was reported to have been distraught over a news media investigation which claimed that Boorda was not entitled to wear the medal. He was said to have been worried that the issue would cause more trouble for the U.S. Navy’s reputation. It is difficult for a civilian to see why disapproval from wearing an improper medal would be serious enough for a man to take his life but an understanding of Mike Boorda’s chart certainly helps us see things from his perspective. Boorda was obviously a strong and successful man as his rise from the ranks to the very top indicated but he did not have much of a sense of himself as an entity separate from the Navy and his own family. All of his personality significators, both the major ones, the Sun, Moon and Ascendant and the minor ones of Mercury, Venus and Mars are in Mutable signs. Mutable signs occur at the end of each of the 4 seasons and they are chiefly concerned with breaking up the energy of that season in preparation for a new season to come. So people with a lot of Mutable signs tend not to have a strong clear fixed notion of themselves and indeed do not wish to have. They tend to identify with the idea of subsuming the self and becoming part of something new. People with a strong Pisces are often required to sacrifice themselves in one sense or another and the apex Mars in Pisces in the 12th house meant that Boorda’s devotion to the Navy and his duty required of him the ultimate sacrifice. Pluto’s transit ensured it was given.